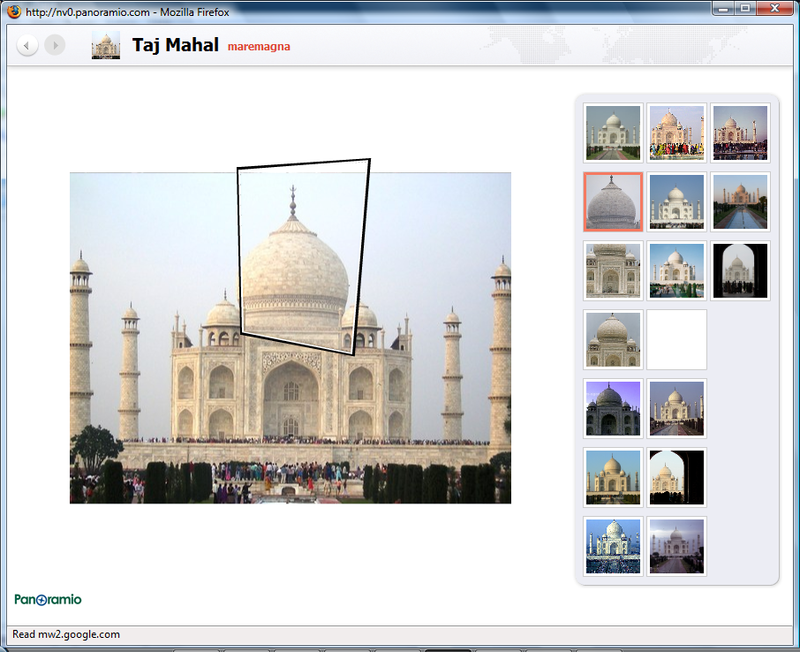 Google’s Panoramio has launched one of the most exciting advances in online pictures since flickr added geotagging. A new “Look around” feature shows you when pictures are available from other angles. The UI is a bit confusing. For example, in the screenshot there is a blank image in the middle. I assume that means something, but I haven’t been able to figure out what. The same goes for the overall arrangement of thumbnails. Regardless, it’s a lot of fun to play with. Microsoft’s Live Labs has been demoing similar technology called Photosynth for more than a year, using images of the Basilica di San Marco. Photosynth offers a spectacular 3D overview. I’d love to see it out of the labs. Until then, I’ll be playing with Panoramio. Check out their take on the Basilica. Read more on Panoramio’s blog. Disclosure: I work for a Microsoft subsidiary. This entry was posted in flickr, fun, geotagging, google, microsoft, photography, travel, web 2.0. Bookmark the permalink. Love that Panoramio! Thanks, Rocky!